Ann Misenheimer and Cornerstone. Photos by The Book LLC. North Salem, New York – Ann Misenheimer and her own Cornerstone were presented as Grand Adult Amateur Hunter Champions after topping the 50 and Over Division on Thursday at Old Salem Farm Spring Horse Shows, running May 10-15 and May 17-22 at Old Salem Farm in North Salem, NY. 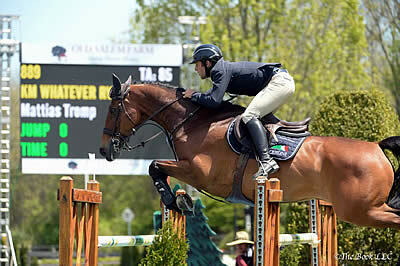 On the Grand Prix Field, Mattias Tromp of North Salem, NY topped the $10,000 Open Jumper 1.45m aboard KM Whatever RV for owner Bayaert Farm, Inc.
Misenheimer, who hails from Unionville, PA and trains with Stacia Madden, rode to three blue ribbons over fences to earn the Grand Adult Amateur Hunter Championship, her first-ever grand champion honor at the Old Salem Farm Spring Horse Shows. Misenheimer and Cornerstone, a ten-year-old Brandenburg mare, were also fifth under saddle and fifth over fences. Peaches, as Cornerstone is known around the barn, has been with Misenheimer since 2012 and has carried her owner in both the Adult and Amateur-Owner Divisions. Bred as a dressage horse in Germany, Cornerstone was found for Misenheimer by hunter judge, Scott Williamson. But Misenheimer’s attraction to Cornerstone wasn’t exactly traditional. Four years later Misenheimer admits it’s like a dream come true to be able to show at her current level after riding as a child. This week marked KM Whatever RV’s first time on the Grand Prix Field at Old Salem Farm, and Tromp admitted that he felt very brave. “It’s a beautiful venue and one of the nicest places to show at,” concluded Tromp, who was also third on Thursday in the irons of Triomphe Z for Bayaert Farm, Inc.